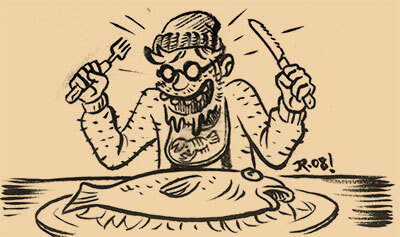 First, an interview with Robin McConnell over at INKSTUDS. 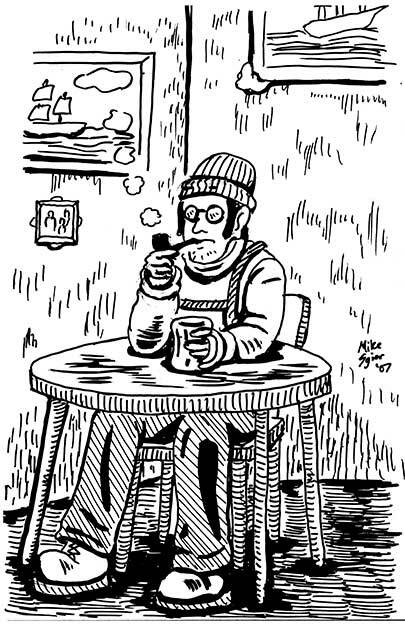 Tom Spurgeon's blog turned me onto Inkstuds about a year ago, and it's really an honor to now be listed among the ranks of Robin's interviewees. Also, the gentlemen at THE MILD MANNERED PODCAST made me blush with this lengthy analysis of FA. Finally, I had a fun time hanging out with Charlito & Mr. Phil over the summer behind the Top Shelf booth, and at one point we sat down for chat. Check it out at INDIE SPINNER RACK. People keep writing reviews, so we'll happily keep posting them! 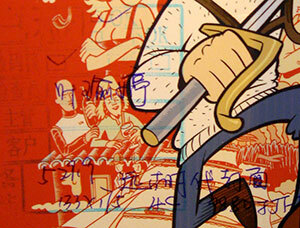 First up, a great review of Big Funny from Mark McGinty, our friend at The Boogle. Next, a Far Arden review from Rain Taxi, which is notable because it's IN PRINT. That's right, a rare ink-on-paper review. You can pick up a free copy around town, or better yet go to Rain Taxi's annual Twin Cities Book Festival happening October 10th at the MCTC cafeteria. BTA has proudly manned a booth there for years, but unfortunately we have to miss this year because of a vortex of scheduling conflicts. But you should go, as it showcases everything awesome that's happening in the local literary scene, from poetry to comics to novels to children's literature. 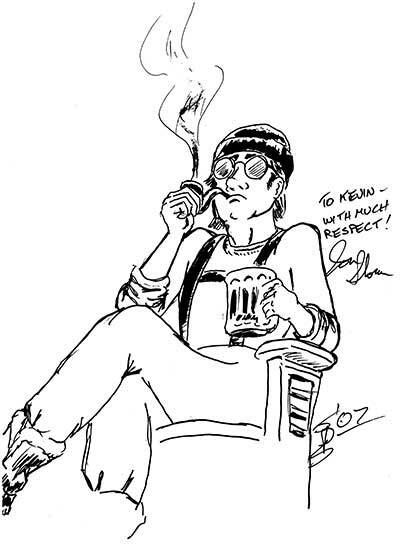 Next up is a review of A Time to Thrill from Adrean Clark at Comics Bento. Thanks, Adrean! * As opposed to "Reviews A-Pawlenty," which makes no sense. 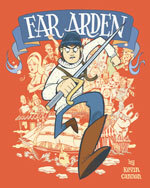 There has been a slew of very thoughtful reviews of Far Arden lately, and I would be remiss if I didn't mention them. The surreality of reading complete strangers' thoughts and criticisms of this bizarre little book has not worn off, and I hope it never does. Click on the logos to read the full review. I highly recommend the $3 That Salty Air and the $14.95 Far Arden. Thanks to Britt Aamodt and KFAI 90.3 fm for having Zander and me over to the recording studio last week. We chatted about T-Minus: The Race to the Moon and Far Arden, and those conversations have been turned into radio dramas! The Far Arden one went live a few days ago, and the T-Minus one will launch on July 20* (yep, the 40th anniversary of the moon landing). 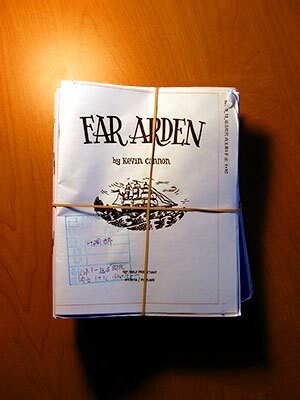 Also, many thanks to Matt Peckham and Brandon Schatz for their recent reviews of Far Arden. Matt calls the book a "glorious pulp throwback" which is a huge compliment. 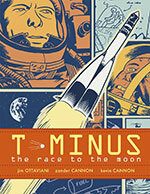 Check out Mark McGinty's reviews for T-Minus: The Race to the Moon and Far Arden at theboogle.wordpress.com. 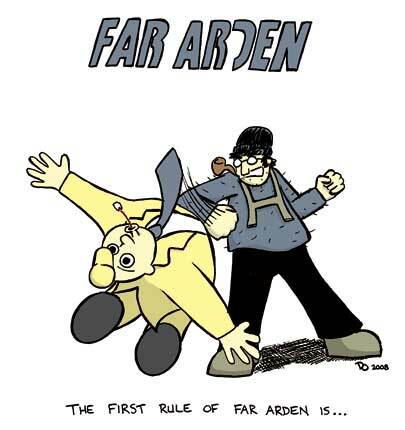 ... and don't forget, Far Arden comes out TOMORROW! Two more reviews have hit the airways, which is great considering the book isn't even out yet. 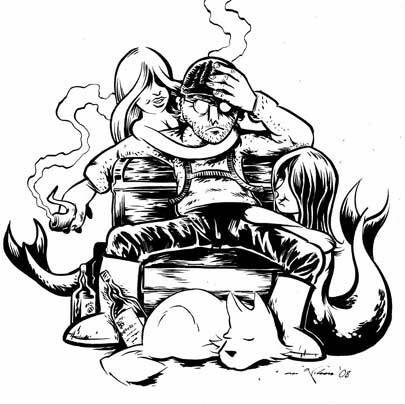 I recently chatted with comics journalist and long-time Far Arden supporter Tom Spurgeon about life, love, and comics, as part of the CR Sunday Interview series. So if you want to learn about the time I lived in a theme park for three weeks, or get a behind-the-scenes look at a Far Arden easter egg, then this is the interview for you. 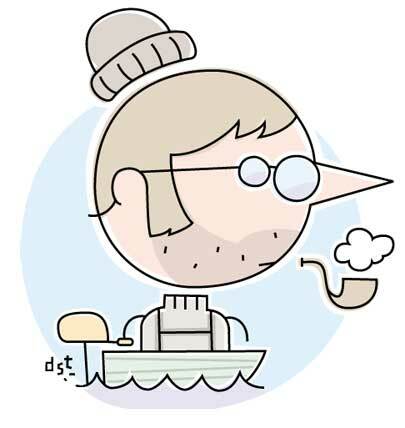 And I got so caught up with the MoCCA convention and the launch party that I failed to post about this interview with Alex Dueben at Comic Book Resources. 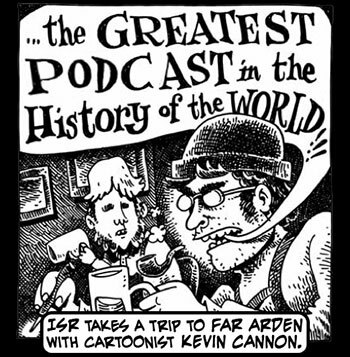 Alex and I get down and dirty about the creation of T-Minus and Far Arden, and how I ended up at Top Shelf. 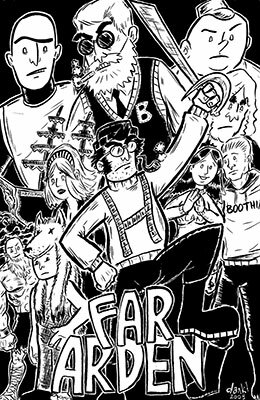 Kevin's tour de force graphic novel Far Arden is hitting stores this month, and in honor of its unique* mix of cartoonishness and high adventure, I've compiled this list of the sound effects that grace its pages. 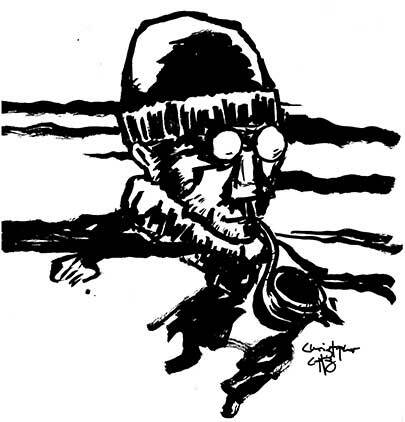 Such a compendium of universally descriptive emanata has never before been seen because Kevin has a rare condition that we in the comic book business call onomatopoeia-deafness. So here, for your pleasure, are the 271 sound effects in Far Arden. Be advised, if you read it very, very closely, there may be some spoilers. PANT! PANT! PANT! PANT! PANT! PANT! PANT! PANT! POUND! POUND! POUND! POUND! POUND! POUND! *unique, that is, until his next book. 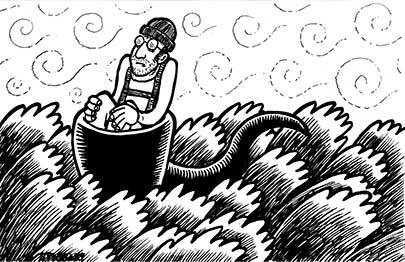 Okay, now off to MoCCA...! Far Arden Excerpt on New York Magazine's "Vulture"
Far Arden: The Book officially launches in four hours. Thanks for the send-off, New York Magazine! 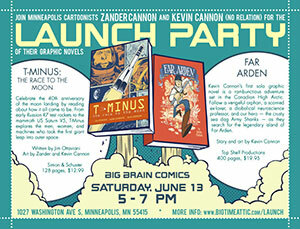 Zander and I are having a signing/party at Big Brain in June, the weekend after MoCCA. 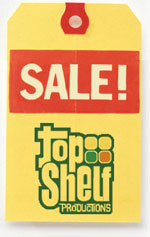 Powell's Bookstore Blog is in the middle of "Top Shelf Week" and they invited me to write about Far Arden. Being a little rusty at straight prose, I instead drew a comic strip detailing the birth of the 288-Hour Graphic Novel Challenge. The strip itself is more about our local 24 hour comic day events here in Minneapolis, and even co-stars local hero Steven Stwalley. Every year after 24 Hr Comic day I swear "NEVER AGAIN." 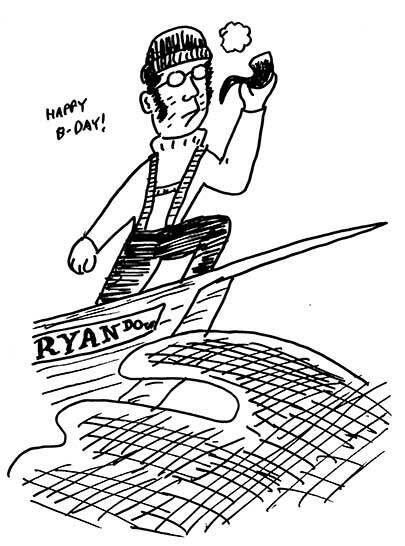 I haven't followed through on that threat yet, but hopefully this Powell's cartoon will illuminate why I -- or anyone -- would vow to steer clear of 24HCD in the future. 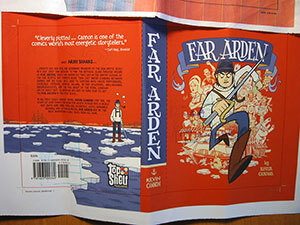 In a little over a month, the real, ISBN-laden Far Arden will hit the shelves. In the meantime I've received the dummy copy from our printer in China. Chris and Brett at Top Shelf shipped it to me after signing off on it, and since I'm the end of the line, I get to keep it! 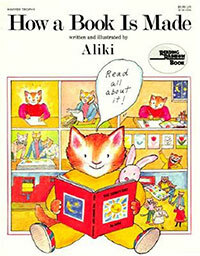 I'm really excited about having this dummy, probably because one of my favorite books as a kid was Aliki's How a Book Is Made (which may have been the first graphic novel I ever read). Anyway, the part where Aliki's furry main character gets a dummy copy of her book from the printer stuck out to me as the highlight of the entire publishing process. Sure, having the final book is great. But the dummy stands on its own: there's only one in the world (compared to the thousands of printed copies), its role is of critical importance (the last chance to check for mistakes before the plates get burned), and it's a novelty (the first time you get to see your book in one printed unit). 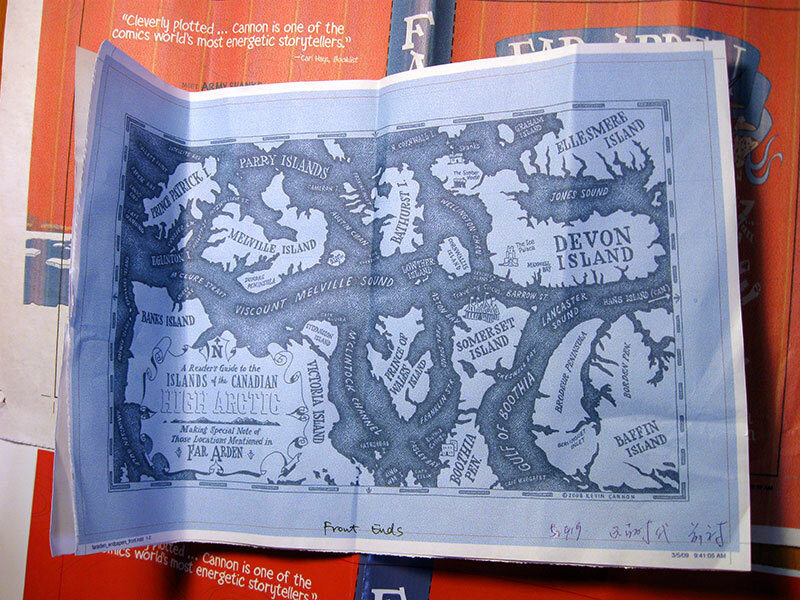 A digital print out of the cover. The book will be hardcover, and so there needs to be a lot of bleed where it wraps over the cover board and tucks behind the endpapers. The endpapers will have the arctic map that was on the the interior pages of the self-published version. 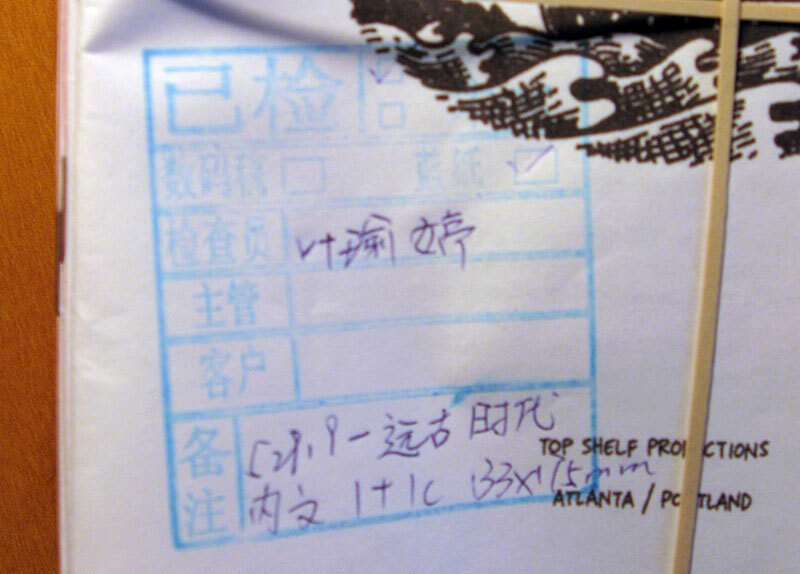 The 384 page book is divided into 24 signatures. Printers print books on large sheets of paper -- in this case 8 pages per side -- and then cut and fold these large sheets down into 16 page booklets. 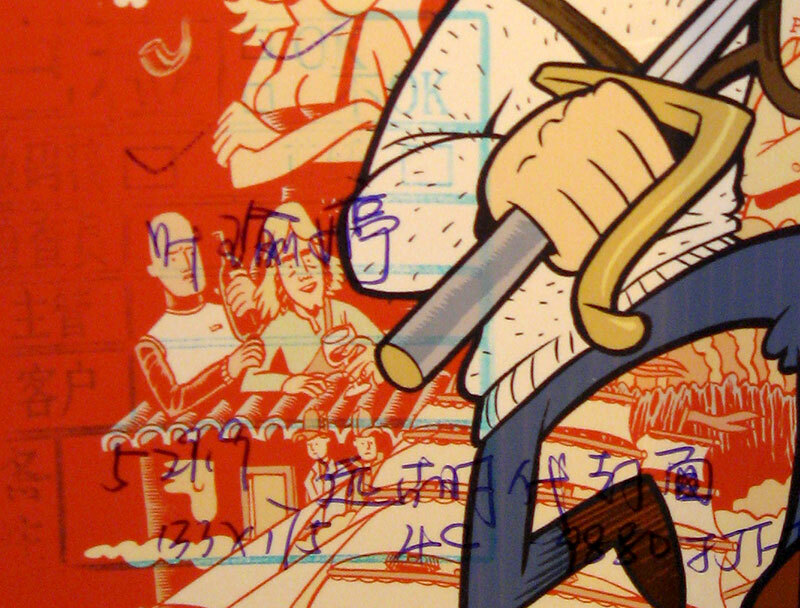 Crack open most hardcover books and you can see the signatures. 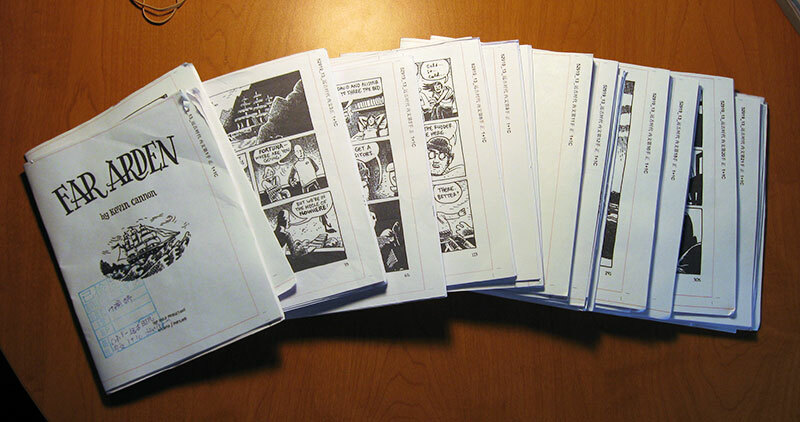 Because books are printed on such large sheets, the interior pages (usually) have to be multiples of 8 or 16. This is why you might see blank pages at the beginning or end of a book -- they are parts of a signature that have no content. Here are some samples of the Chinese markings from the publisher. 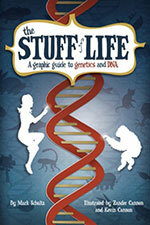 They probably read, "This American book looks nutty, but it's ready to go to press." Finally, here's the whole book wrapped up. She's a beast! 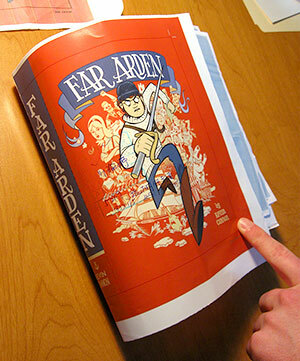 Both T-Minus and Far Arden come out in May, so it's going to be a busy spring! 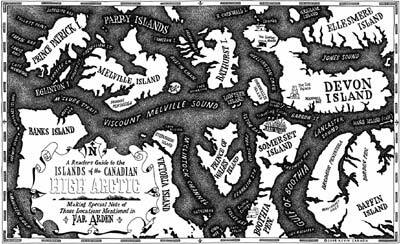 Support arctic fiction! 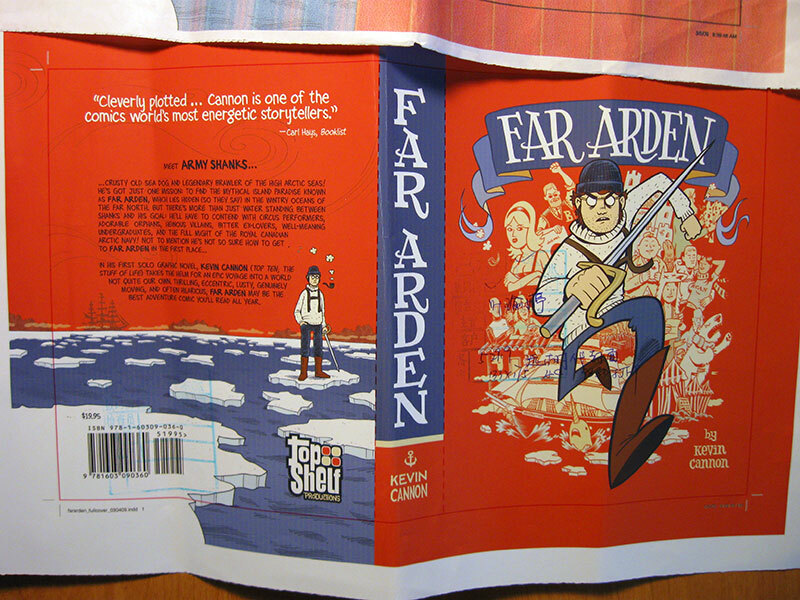 Pre-order Far Arden today! Sean Kleefeld has a review of Far Arden up on his "Kleefeld on Comics" blog. 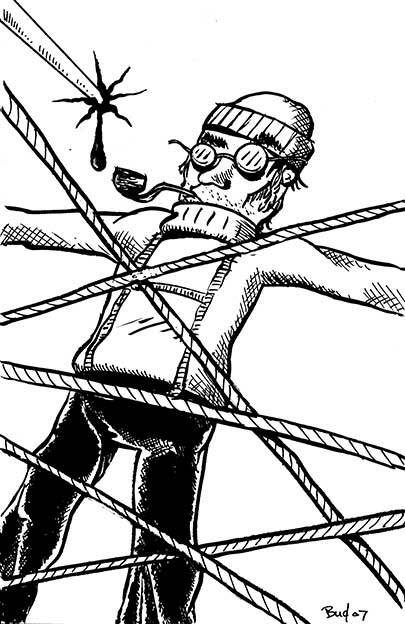 In it, he struggles with the same problem I've had recently: trying to explain what the hell the book is about. 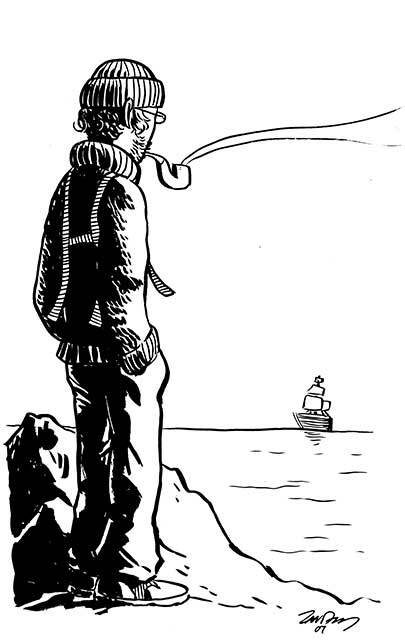 My attempts at summarizing FA usually melt into a babbling mess, so as of this morning I'm just going to start saying it's "Jack London meets James Bond" and leave it at that. Warning, Kleefeld's review has a few spoilers. Thanks for the review, Sean! Thanks for the link, Steve! The book hasn't been optioned, but already there's a movie poster! Thanks to Dank! aka Danno for this amazing 11x17" poster of Far Arden. 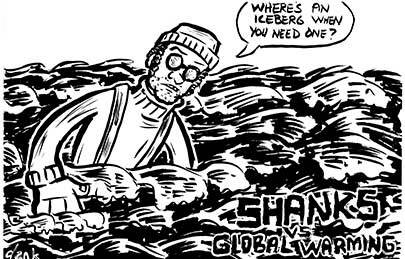 Click on image for larger version! 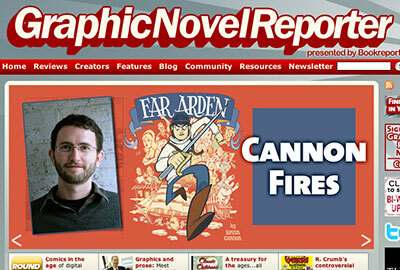 Also, Doc's blog turned me onto a ridiculously addictive blog, photoshopdisasters.com. 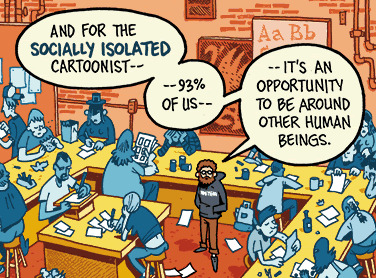 Half of me says "I'm horrified" and the other half says "Yeah, YOU try doing some of this stuff on deadline!" Here's a map I made this weekend. 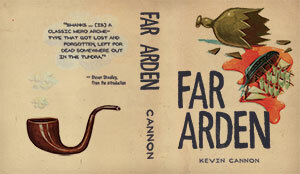 It'll be nestled in the front pages of the Far Arden paperback. 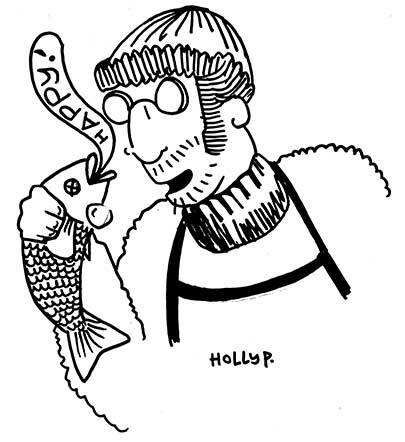 The current plan is to print up 100 copies and have them for sale ($20) at the May 2nd Lutefisk Sushi show. I think 100 copies should do the trick, but if you want to make sure you get a copy -- or if you're out of town and can't make the Sushi show -- send me an email and we'll figure out a pre-order/mail-order thing. Electronic mail is kevin "at" bigtimeattic "dot" com. 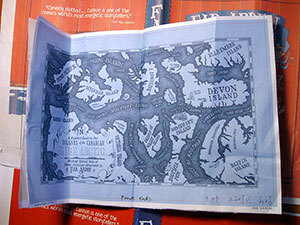 Thanks to Steve and Zander for the idea to make a map! Official Armitage Shanks Fan Club! Welcome all! Kevin Cannon has finished his latest magnum opus, Far Arden, to rave reviews. Here we can all show our appreciation for his incredible project and steel ourselves for his next one. 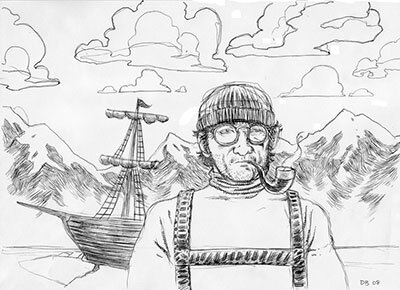 Want to submit your own homage to the great lonely pirate? Email it to zander at this url, bigtimeattic.com.